The beauty industry has a constant demand for qualified, creative, and well-trained graduates. As a cosmetologist, you can specialize in hair styling, makeup, or nails, and your career and workplace can look as varied as the people you work with. Students interested in becoming a beautician or cosmetologist need to complete a state-approved training program. Certificate or associate degree programs are the most popular forms of cosmetology education. You’ll take courses in technique, safety, and marketing as the school prepares you for the state exam required for licensure. Tuition varies by the beauty program and school location. Make sure your school is accredited, otherwise you won’t be eligible to sit for the state boards. Get your high school diploma or your GED. Attend a state-approved cosmetology school through a community college, cosmetology school, or trade school. Training takes between nine and 24 months. Take and pass your state’s licensing exam. Work in a salon as an apprentice. It can take up to two years to get your own chair. Complete your continuing education (required in many states), and pay the fee to apply for your license. Retake the exam if you move out of the state you’re licensed in, so you can work in your new state. You, out of all your friends, are the go-to person for makeup and hair. You love experimenting with hairstyles and color. Not only do you have a natural talent for it but also the passion and drive. This is it; cosmetology is the career for you. Nothing can stand between you and cosmetology school. Find out more about becoming a licensed cosmetologist below. You may already know, but cosmetology is the umbrella heading. Underneath, there are a variety of careers to choose from. 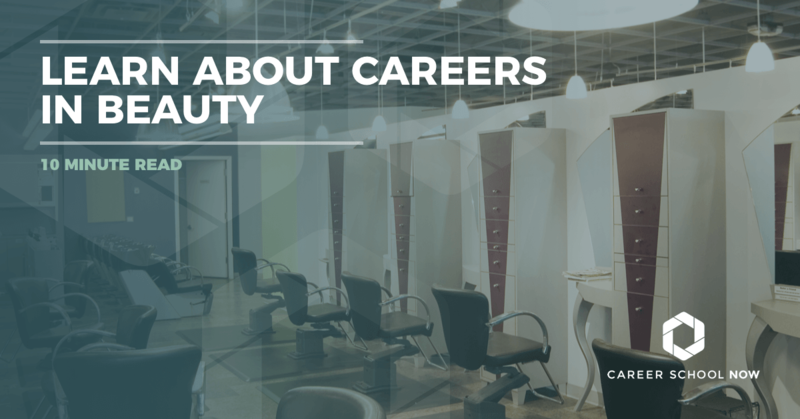 While your cosmetology education should be well-rounded and touch on every aspect of the field, you will probably decide to focus on one aspect of this career when you get out into the real world. You’ll find there is always a demand for hairdressers or stylists, barbers, skincare specialists, and cosmetologists. However, beyond those careers, there are a plethora of others to consider. And those cosmetology careers listed are just a tip of the proverbial iceberg. If you can dream it up, then you can achieve it! Skincare specialists are a highly valued and important asset to any spa business. As an esthetician, you look beyond the surface to identify any skin-related problems and provide avenues for treatment. Allowing someone to see his or her true beauty is an incredible gift that estheticians have the opportunity to give—one skincare treatment at a time. Estheticians often find that their role is multifaceted. As a skincare expert, you work alongside patients—and often times, doctors—to identify the best avenue for treatment. Estheticians can be qualified to perform facials, facial massages, chemical peels, eyebrow tinting, hair removal, and makeup application. Becoming an esthetician requires training in the technology methods that purify, balance and renew the skill. Hands-on training is crucial to your success in the field and is a different track than cosmetology. Most esthetician programs allow you to perform facials, hair removal, body treatments, and apply makeup first hand. Part of your training as an esthetician will also include business skills and wellness therapies. You are required to pass a state certification exam and earn the state-required esthetician license before you can practice. One career option includes the medical field. Estheticians can choose to specialize as a medical esthetician. This specialty requires further training but can provide opportunities alongside dermatologists and plastic surgeons. Other opportunities can be found working with cancer patients or special needs patients to improve their sense of wellbeing. According to the United States Bureau of Labor Statistics, the demand for estheticians is expected to grow 13 percent through 2026, which is faster than the average for all careers. The median hourly wage for skincare specialists is $14.46. If you’ve been working for a few years, you will probably make closer to the highest hourly rate: $28.27. Cosmetology programs are available at most beauty schools, community colleges, and trade schools. These programs are offered at the certificate and associate degree levels and require a great deal of practice, in-person observation, and interactive learning. While some schools allow students to complete the classroom portion of the programs at home, the hands-on component must be completed in-person at their respective schools. Whether online or in the classroom, students should make sure their cosmetology program is accredited by the National Accrediting Commission of Career Arts & Sciences (NACCAS). The NACCAS evaluates schools based on their curriculum, facilities, supplies, equipment, rate of licensure, placement rate, and student support services. Also, if you like working with people but are still searching for the right fit, check out medical careers and take one of the three medical practice tests!